This is as fascinating as it is unsettling. 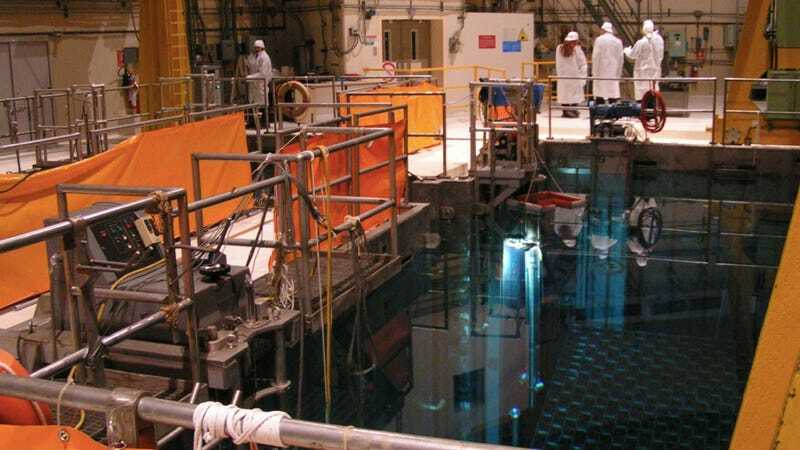 Scientists at the Department of Energy's Savannah River Site — a nuclear reservation in South Carolina — have identified a strange, cob-web like "growth" (their word, not ours) on the racks of the facility's spent nuclear fuel assemblies. According to a report filed by the Defense Nuclear Facilities Safety Board, "the growth, which resembles a spider web, has yet to be characterized, but may be biological in nature." The safety board's report claimed that the initial sample of the growth was too small to characterize, and that "further evaluation still needs to be completed." I don't know what's more intriguing — the fact that the "growth" resembles a spider web, the fact that it may be biological in nature, or the fact that (even after collecting a sample of the stuff) we still don't know what it is or where it came from. We've already tried getting in touch with both the Savannah River Site as well as the Defense Nuclear Facilities Safety Board, but so far have been unable to speak with anybody to ask additional questions about the growth and where it's occurring specifically. Could we be dealing with an unknown species of extremophile? It's possible — the Savannah River Site's storage facility (The L Area Complex mentioned above) stores spent nuclear waste in pools that are anywhere from 17-30 feet deep, and while that water is enough to protect the site's workers from radiation, the growth was reportedly found underwater on the submerged fuel assemblies themselves. Having said that, we're still not clear on how much, if any, radiation this growth has actually been exposed to. Organisms with a natural resistance to radiation are said to be "radioresistant," and certainly do exist; Deinococcus radiodurans, for example (pictured here) is not only one of the most naturally radioresistant organisms on Earth, we've actually genetically engineered Deinococcus that can be used in the treatment of radioactive waste.